I just watched the most recent DokiDoki Precure, which is episode 31, and I was very impressed with it. Very impressed is quite the understatement actually. This episode was as true a statement of the world we find ourselves in as I have ever seen. In the episode, minions of King Selfish launch a fearsome attempt to destroy the world. They send out Seeds of Selfishness throughout the world. These seeds worm their way into everyone’s hearts. First the people become unconscious. As the seeds spread and grow in their hearts, we learn that the people will turn into Selfishnesses and will destroy their own world. That is quite a chilling image. It is chilling in that this is exactly what this world is facing today. The Seeds of Selfishness are an extremely accurate metaphor for the poisons of the Modern world, atomization, deracination, and deformation. The term deracination can also be used to refer to all three of these poisons collective. Deracination acts in the exact manner as was depicted in this episode. First, it render its victims unconscious. While the Modern victims of deracination are not physically unconscious, they are psychically unconscious. They do not know or understand what is happening to them for the most part. In this unconscious state, the Seeds are sprouting, and the people are in danger of destroying their own world. Happily Precure is not a post-Modern Western show, so the plans of the Selfish Kingdom fail. The Precures are standing in their way. Interestingly, two of the Precures, Cure Sword and Cure Ace are from different worlds, both of which were destroyed by King Selfish. The manner in which the Precures prevail in this episode is truly fascinating as well. In the previous episode, the girls retrieve a Lovely Pad. This Pad is 10,000 years old, and has been guarded for all that time. This Pad also holds the soul of the very first Precure, Cure Empress. At first, the girls do not know what to do with the Lovely Pad, and none of the technology available to the girls through Alice-chan can help the girls in discovering what the Lovely Pad is or it can do. During the battle with the minions of Evil, the 10,000 year old Lovely Pad is broken into 5 pieces. This is an apt metaphor for deracination (the severing from our roots), I believe. Cure Heart picks up the broken pieces while the Evil Minion taunts her about it. Despite this, the girls are bullied to the point of what looks like sure defeat. 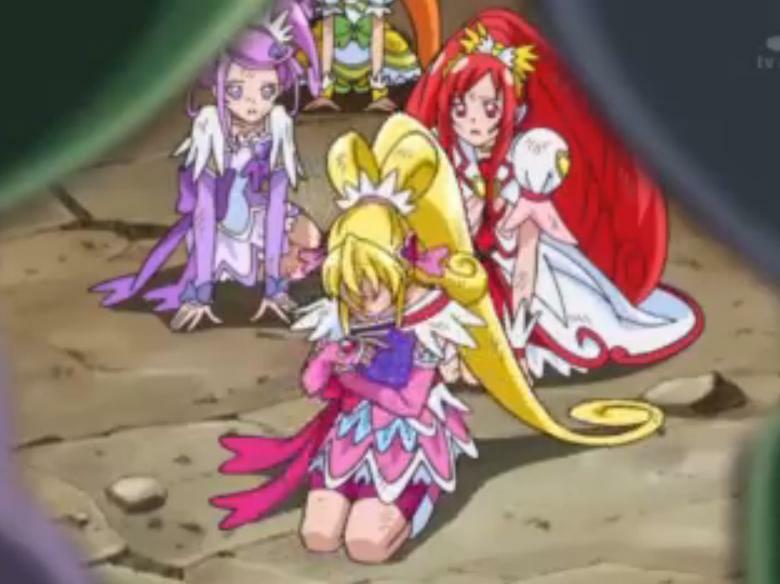 Cure Heart drops to the floor and cries, saying that she now understands the pain Cure Sword and Cure Ace went through when their own worlds were destroyed. After a long and deep cry, Cure Heart gets back up on her feet and gets ready to fight again. 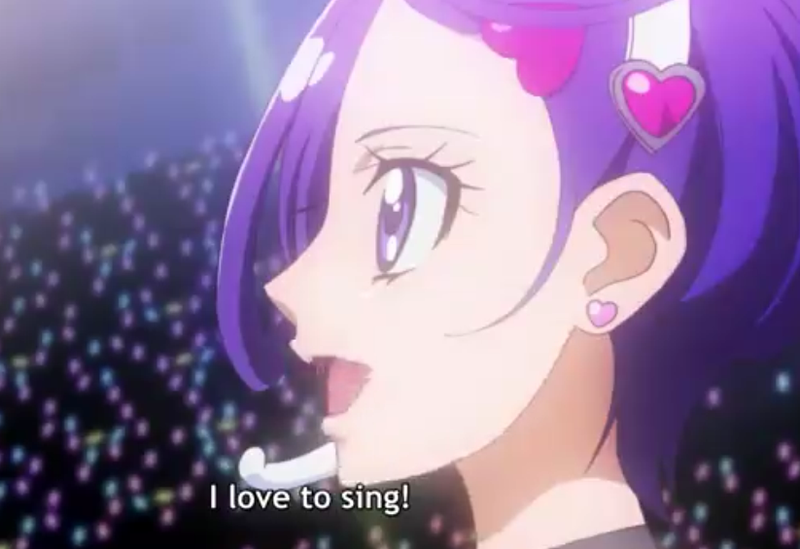 She begins with the Five Vows of the Precure, and each of the girls join in. They realize that their feelings are strong enough to prevail no matter what. As they get back up and decide to continue fighting, the broken pieces of the Ancient Pad form into a new Pad for each of the girls. At this point, they can combine their powers, and they are able to defeat the Evil Minions. All of this is a metaphor for the Senshi here, I believe. We have decided that we will never give up or give in to the Forces of Darkness. We know that we have a broken 10,000 year old Lovely Pad. This is knowledge of Ancient Wisdom that has been lost to our world. In our persistence and determination, we pick up these pieces and hold on to them, despite the taunts of the Modern World. In our determination to keep fighting so long as we have breath, we give the broken pieces new life, and these give us the power to combine our forces to defeat the Minions of Darkness! 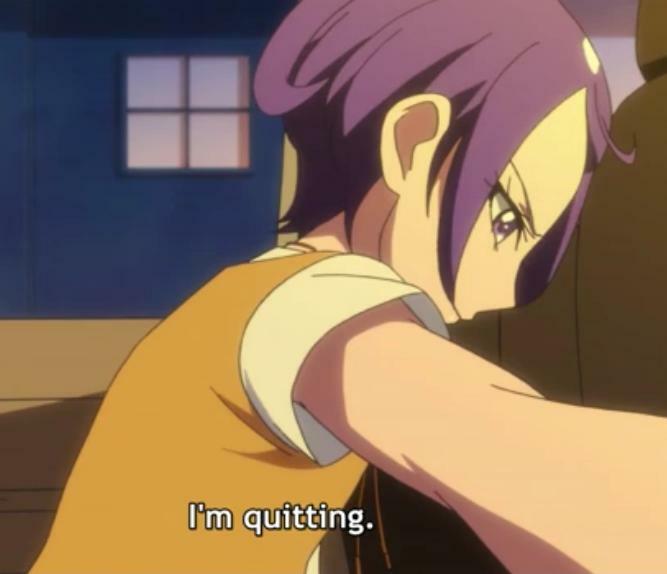 DokiDoki Precure Episode 24 has aired, and Cure Ace is still a mystery. We know now that her civilian identity is Madoka Aguri, and she is a fourth grader. 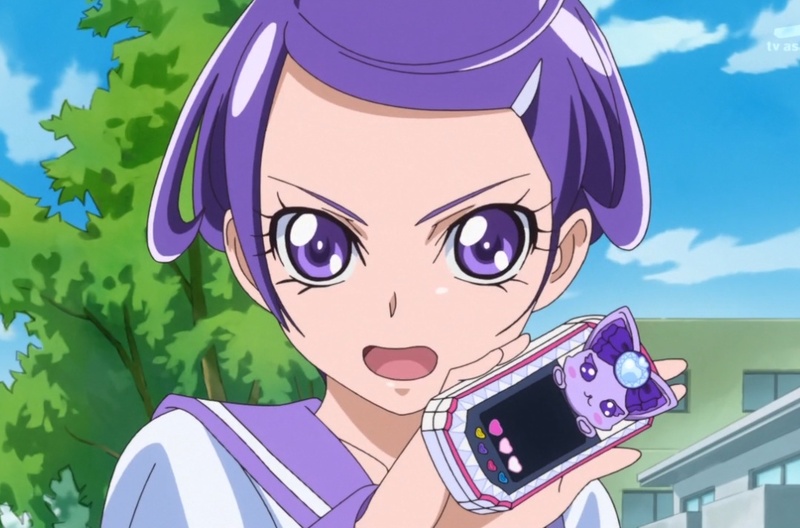 Though she is younger than the other girls, she speaks to them with authority even from her non-Precure form. She has assumed the role of senpai with the other girls, and the other girls accepted her in that role. As senpai, Cure Ace has been teaching the girls (and us) about the nature of love. Last week, we learned something that was not love. When Regina-san fell into despair over Regina-san returning to King Selfish, we were told that she had lost her love. We were told that love meant continuing to work and to fight even though Regina-san was lost (at least temporarily), rather than to succumb to grief. This week, we learned a new lesson about love. MakoPi-chan has decided to quit singing. She had been singing in order to find the Princess, and she started to believe that her singing was now useless. The Princess was found, but she was frozen inside of a crystal. From this perspective, MakoPi-chan could not see the point of continuing to sing. As MakoPi-chan was contemplating the announcement of her retirement, and as the other Precures were fighting another Selfishness, the Princess finds a way to reach MakoPi-chan, even though she is still frozen. 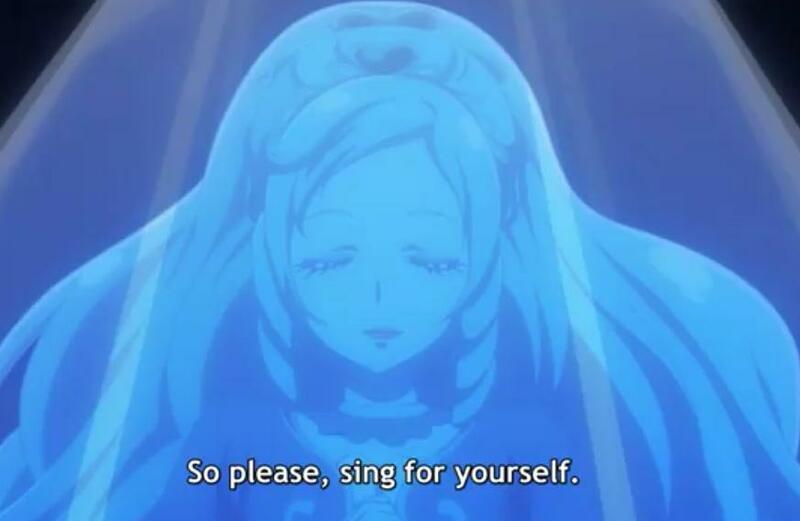 The Princess tells MakoPi-chan that she could hear her singing even in a frozen state, and that MakoPi-chan’s singing helped bring her out of despair. The Princess implores MakoPi-chan to continue to sing, and to sing for no other reason that her own love of singing. 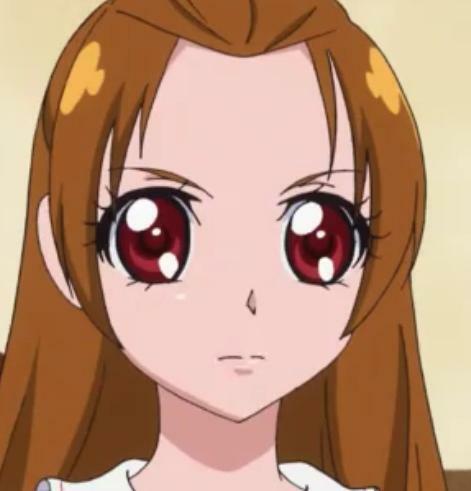 After her talk with the Princess, MakoPi-chan is able to transform and to join in the fight with the other Precures. Evil tried to tempt her again, telling her that it was selfish to sing for her own personal love of singing. At this point, MakoPi-chan explained that her friends were cheering her on, and they all wanted to see her have fun while she was singing. We also learn that doing things that you adore is the nature of love, and that when we do things we love, we spread that love to others. 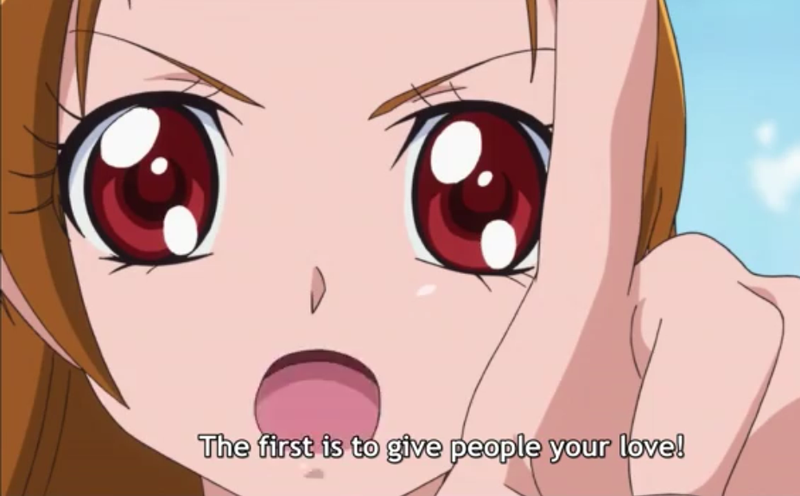 We also learn that the power of Precures comes from love. 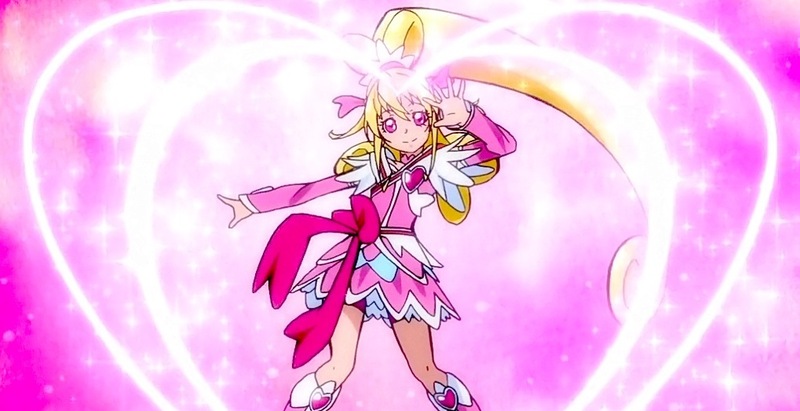 Cure Ace again speaks of the Five Oaths of the Precure, and the first oath being to give people your love. I am interested in learning what the other four oaths are. We would love to hear your thoughts on this subject and your theories of the identity of Cure Ace. I recall a humorous cartoon of Tuxedo Mask reading a newspaper, saying “Call me when the transformations are over”. People occasionally wonder why “transformation is a free action” and why villains do not attack during the lengthy transformation scenes. As humor the idea is fun. As an actual question (which I fancy it sometimes is), it shows the rather remarkable literalness of many Western minds, which actually, when it is not too cynical, is rather kawaii in its artlessness. The truth is, of course, that transformation really takes no time at all. Tatoeba: at the beginning of Doki Doki Precure, episode 16, MakoPi changes into Cure Sword in response to Regina’s behavior. The transformation is instant and the henshin set-piece is “skipped”. Of course, this is how all the transformations take place in “real time” – as viewed by the characters themselves. So are the henshin-scenes merely eye-candy for the viewer? You could look at them that way, but in fact they are a great deal more than that. I am reminded of a discussion concerning a portrait of Admiral Lord Nelson at his last battle. What has the historic admiral to do with Precures – or even Sailor Senshi? Only the obvious. They are all heroes. And that is crucial. The discussion in question centered on a piece of literalistic art-criticism that was a shade too vulgar to be kawaii, though it was certainly artless. The critic poured ridicule on the picture of Lord Nelson looking resplendent in full dress uniform, pointing out that he would not have been wearing dress uniform on that occasion, that he was wounded, suffering from dysentery and had not slept and would almost certainly have looked a mess. A realistic picture, says our naïve critic, would have depicted him like that. Well, that entirely depends what you mean by “realistic”. If you mean simple literalism, then the critic may be correct. However, the true duty of art is to depict something more than the mere material surface of things. The portrait was completely realistic in the way that actually matters. It depicted the hero rather than the accidental circumstances of the moment. It depicted what was real and lasting and fundamental in the scene rather than its surface trivia. Become the heroine you are! That is precisely what the transformation scene does in Precure and other Magical Girl series. It depicts not the real-time event as it “actually” might happen, but the heroic transformation and the full glory of the heroine. It takes the time to depict what actually takes place in the heart of the heroine because the communication of that truth cannot be instant. I have called it a truth because that is what it is. The Precure series is about the universal battle between good and evil, and it is subtle enough to be fully aware that this battle is not just an exterior one, but also takes place in the human soul. As such, it is a series about the very fundamentals of conflict and heroism and it reflects the heroine we can all be if we choose the Light. The glorious transformation that choice unleashes may not take place visually (though I believe that making ourselves pretty is an important part of it!) but it is just as beautiful in each one of us as its artistic depiction shows it to be. And that, I believe, is why transformation scenes are so popular. They call to something deep and powerful – and also pretty. After all, Beauty is the signature of Truth!